Marty Console, designed by Marco Piva for Visionnaire Home Philosophy, is the winner of Wallpaper Design Awards 2019 in the category Dream Factory. In the Marty collection, the glass tops have been transformed into volumes, the bases are themselves volumetric compositions of different materials. Stones and metals give a sense of monumentality to compositions intended to be functional centres of important and exclusive seating areas and living rooms. 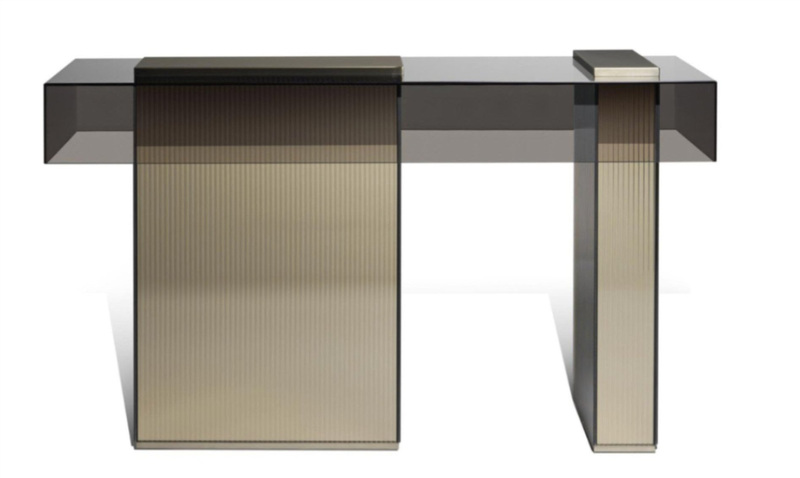 Marty’ console for Visionnaire contrasts ribbed and smooth glass to architectural effect, while the South Korean designer Jihye Kang’s ‘Purity’ side table pairs clear acrylic rods with a stainless-steel base. Extra brilliance is provided by Stefan Diez’s cylindrical ‘Guise’ hanging light for Vibia, and Angelo Mangiarotti’s re-editioned ‘Lari’ table lamp from 1978, hand-blown in a single piece.